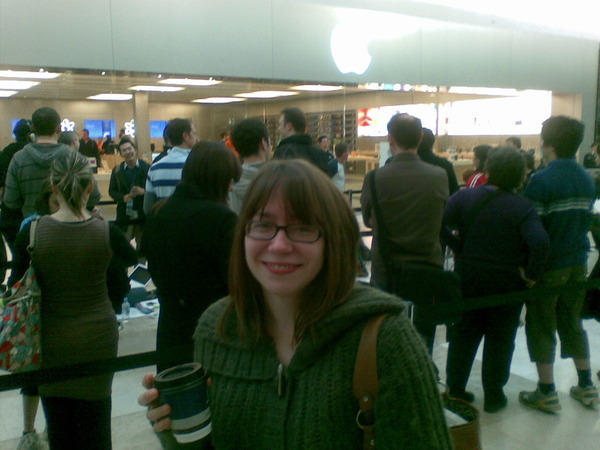 Geoff and I made the early trek to the opening of the Apple store in Doncaster. Geoff also made it to the Chadstone one, which probably classifies us both as nerds – be we knew that anyway. Was quite a pleasant wait with free wifi (from Apple) which I made use of on my new phone and a fair-trade latte which was surprisingly good despite it coming from Jamaica Blue. So we were in about the first 60 or so people to get in and got our free tshirts – they are rather huge. I had to laugh at the 4 very nerdy looking guys who had camped out overnight to be the first customers… they were very wizard of oz when they walked in (Think linked arms, hi-ho hi-ho lets do this together etc…). Sadly my friend Jess (who has a job there) was sick this morning so we didn’t get to see her run around like crazy screaming – that was disappointing indeed, did however see Ryan whom we know from YVV. So yes, *taps nose* I have friends in high places. I was at the Chaddy opening – one of the first 60 or something. haha, it was not that early (about 8:15am) when we got there. We did it for amusement and a free tshirt. The guys there who stayed the night would’ve been there for the ‘glory’ of being the first in the Apple Store doncaster – not such a big deal as it’s not the first in Victoria unlike the Chadstone store. It’s a nerd thing.